This month we are honored to recognize another Veterans Home resident who proudly served our country in the United States Armed Forces. In 1986, Bill Skiles, a native St. Louisan, joined the Army Reserves and took his basic training at Fort Leonard Wood, Missouri. Going active duty in 1989, Bill transferred to Fort Polk, Louisiana as a mechanic with the Corps of Engineers. In 1991 the battalion deployed to Honduras to rebuild roads that had been neglected because of the Country’s political and economic troubles. This was the height of the monsoon season and there were no structures standing. First, tents were set up to house personnel. Also needed was covered space for maintenance shops, a communications center and storage. In a display of “Engineering Ingenuity”, the team designed a swimming pool that utilized generous rainfall and the cool waters of a nearby stream. Following Honduras, Bill was assigned to the Military Police unit at Seoul, South Korea. Soon, Specialist Skiles’ vehicle maintenance skills became a valued asset to the unit’s mission. The year 1993 brought wedding bells and celebration for Bill and his new wife, Wendy. The couple later became parents to a son, Steven and a daughter, Sarah. In 1995, having served three years in the Army Reserves and five and a half years active duty, Bill returned as a civilian to his home and family in St. Louis, Missouri. The prospect of travel and good pay drew Bill to truck driver training at Schneider Trucking Company. Graduation resulted in a full-time position. Teamed with another graduate, Bill and his partner honed their skills in short and long distance hauls. Eager for more responsibility and pay, Bill joined Hogan Trucking Company. Highlights of his time at Hogan included travel to forty-eight States and Canada where he encountered nearly every type of weather and traffic challenge. During these years, Bill had only one accident - an enviable record! In late 2002, at age 35, Bill noticed physical problems starting with lethargy and low energy. Then came pain and weakness in his legs, culminating in a fall and a fractured ankle. Bill’s arms, while still functional, became too weak to lift the heavy loads required in his work. Finally, our veteran was forced to leave his much loved driving job. Soon thereafter came the diagnosis of Multiple Sclerosis. Bill entered a nursing home. At first, he could feed himself and do other light tasks. Eventually, all use of his arms was gone. Life at the nursing home was, as Bill described it, “….a lot like being in a prison.” There was little in-house activity and few trips out. Staff indifference added to Bill’s worsening depression. Previously, Bill used a mechanized chair that provided transportation but offered few other options. Today, Mr. Skiles’ life is enhanced by a mobile chair that provides a wide range of functions and conveniences. Controlled by the operator’s head, the unit tilts, reclines, elevates the legs and raises or lowers the seat. It will rotate in place, reverse position or travel forward at a speed selected by the driver. From his chair and bed, Bill accesses an environmental control unit (ECU) to turn on his room lights and flash the nursing call signal. The system activates the cable box, the television set and telephone. Bill regularly studies or communicates using his voice-prompted computer. In the near future, he will benefit from a high-tech bed that features therapeutic and comfort positions not now available. For many years, Bill Skiles has enjoyed painting, ceramics and other visual arts. Since his arrival at the Veterans Home this practice has been renewed – sometimes brilliantly. 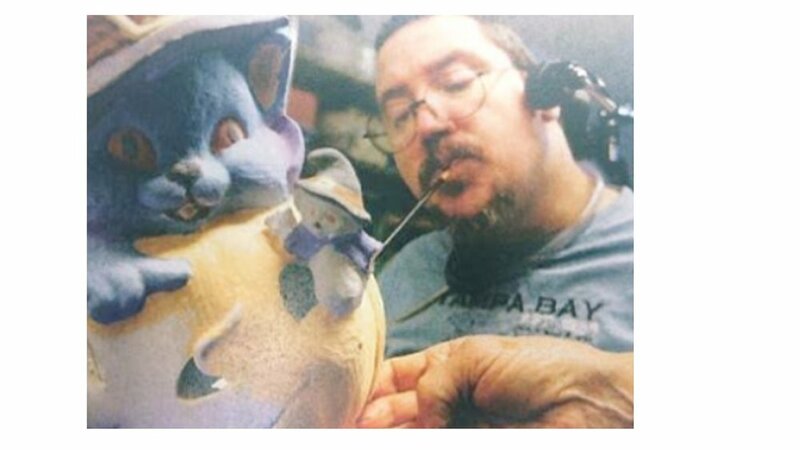 Through his participation in the Recreation and Arts Program at the VA’s Jefferson Barracks Facility, Bill has discovered ways to broaden his creative skills. In early 2014, he was interviewed by PN Magazine. Photos were taken of Bill busy on a current project. He and his work were featured in the October 2014 issue of the magazine. 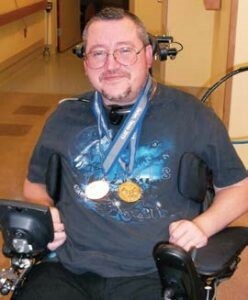 Wheelchair and Powerchair games highlight Bill’s sporting life. Starting in 2012, Bill traveled to Tampa, Florida where he distinguished himself in Bowling and Slalom. Then came the 2013 Wheelchair Games at Spokane, Washington. Here, our veteran won medals in Bowling, Slalom, and Powerchair Soccer. Most recently, Bill returned from the week-long National Wheel- chair Games 2015 held in Dallas, Texas. He is proud to grace his new home with the Gold medal in Bowling and the Bronze medal in Slalom. This conference of players was perhaps the most meaningful in Bill’s memory. He recalls the inspirational closing ceremonies as the perfect conclusion to a week of outstanding athletic performance and new and renewed bonds of brotherhood. Bill Skiles’ hope is for residents of our Home to have more opportunities for fun, skill building and friendship connections with other vets. The challenging wheel chair game, Bocce, is one of the recreational possibilities that Bill would like to see available here. Staff personnel at Missouri Veterans Home St. Louis are now looking into ways to make this and other innovative ideas a reality. Bill Skiles, our friend and inspiration, we are honored to know you and to be allowed to share in your story and your hopes for the future. PLAY ON! Bill loves to paint in his spare time. Bill with just a few of his medals! This month we are honored to say “Thank You” to another Veterans Home resident who proudly served our Country in the United States Armed Forces. Loyd Seabaugh was drafted in 1943. After basic training, Loyd received advanced instruction at Fort Knox, Kentucky. He was then transferred to North Africa where he learned to drive the new light tank that he operated on numerous reconnaissance missions. Then came Belgium and the Battle of the Bulge. Our soldier was wounded in action and sent to England for surgery. Returning to active duty, Corporal Seabaugh transferred to Germany where he served with occupation forces until the end of the war. Family and friends of the now Veteran Loyd Seabaugh rejoiced at his return home just after Thanksgiving, 1945. Not one to let grass grow under his feet, our man jumped into action. Before the Army, Loyd liked working construction, but now he’s looking for something in a more stable industry. He hires on at General Motors. The pay is good and Loyd believes that he is on his way to a prosperous life. What happens? Primarily due to the industry’s slow rebound to pre-war production, hours are reduced. Then, shifts are cut. Lay-off notices come next. Wise folks remind us that when set-backs happen, not to be overly discouraged. Something better may be just around the corner. This certainly has been the case for Mr. Seabaugh. Earlier, Loyd had purchased a house located near Ford Motor Company’s new plant that was scheduled to open soon. Why wait for the official announcement? There would be a long line of job applicants the first day. Loyd tried to get past the front door to see someone. On his third attempt, he saw an important looking man with a brief case approaching. The rest is history. The following Monday, Loyd and three other determined and lucky young men became the first production workers hired at Ford’s new plant! We’ve heard it said, “The job makes the man.” Also, “The man makes the job.” I’d guess that Loyd Seabaugh exemplifies something of both points of view. During nearly 28 years at Ford, Loyd worked in every department of the plant. Probably, his most important responsibility was making sure that each station on the assembly line had an ample supply of parts available. Despite the best efforts of inventory control, problems sometimes occurred. It might become necessary to “beg, borrow or steal” an item from another facility – or to place a rush order with the manufacturer. Loyd recalls an instance when a part was nearly out of stock at a station near the start of the assembly line. If replacements weren’t found quickly, production would come to a standstill. It was Christmas day and the Seabaugh family was sitting down to dinner when the phone rang. It was the plant manager. “No problem,” Mr. Seabaugh assured the boss. A short time later, a tasty holiday meal was removed from the warming oven and served to a grateful family. Life was good! Nearly everyone’s work week has its humorous moments. One such occasion started with a phone call to Loyd from his friend, Bob. A couple of months earlier, Bob had purchased a fully equipped Lincoln Continental from a dealer in town. Difficulties with the car became apparent almost immediately. The dealer made one or two superficial efforts to correct these problems, but the malfunctions remained. Further inquiries from the buyer were more or less brushed off. “Can you say what you have in mind?” Loyd persists. “You’ll see soon enough,” Bob said, chuckling. In junior high school, Loyd had known and liked a pretty girl named Helen. As often happens with school friends, Loyd and Helen moved on with their lives and lost touch with each other. Then, the summer Loyd came home from the Army, who should he see at a Fourth of July celebration? Loyd and Helen started dating and were married on September 21, 1946. During the next five years, four children arrived. Daughter, Cairl, was first. Then came sons, Alen, Gerald and Dairl. Church, community service and recreation were fundamental to the Seabaugh family. The kids did well in their studies, and each was active in school sports. Everybody liked to fish! As the Seabaugh youngsters became adults, more children blessed the family. Loyd proudly shows visitors pictures of everyone, including eight grandchildren and 14 great-grandchildren. Loyd and Helen shared 60 wonderful years as husband and wife. Helen passed on November 22, 2006. For years, Loyd has suffered from hip and knee problems, stemming in part from injuries that he sustained in the war. There were several surgeries, including a knee replacement. In December 2000, doctors recommended the Missouri Veterans Home - St. Louis. For ten years, Loyd Seabaugh has been a vibrant presence in this community of veterans. Recently, at a meeting with medical specialists, our hero received promising news. Thanks to new and improved treatments, Mr. Seabaugh can expect relief from the chronic pain that he has suffered for so long. Loyd, we are glad that you make your home here with us. We look forward to more sharing. Thank you, friend! Loyd loves to recount his tank driving days! This month we are honored to recognize another Veterans Home resident who proudly served our country in the United States Armed Forces. In September 1954, Robert (Bob) Morovitz, a native of Baden, Missouri, enlisted in the U.S. Army and received his basic training at Camp Chafee, Arkansas. Technical School at Fort Sam Houston, Texas prepared Bob for duties as Medical/Hospital Corpsman at Fort Leonard Wood, Missouri. Robert’s unit was later deployed to Camp McCoy, Wisconsin to provide medical services for National Guardsmen participating in summer exercises. In September 1955, Pvt. Morovitz received orders to report to the 565th Ambulatory Support Unit at Camp Baumholder, Germany. The Unit’s mission was to provide medical assistance and ambulance transportation for Army units that were conducting training exercises at various outlying locations. It was pretty much “business as usual” until the tragic hour that terrorists attacked the American installation in Beirut, Lebanon. Heavy casualties called for immediate establishment of emergency care stations manned by qualified medical personnel. Because of the urgency of the situation, Bob’s unit was ordered to make ready to board a plane, fly to Beirut and to parachute with supplies to aid victims of the bombings. Near-panic ensued! Literally, nobody in the unit had ever jumped from a plane or had any type of emergency jump training. Fortunately, other arrangements were made and the alert for our soldier’s unit was cancelled. Robert Morovitz believes that it is more than coincidental that he chose a helping profession starting with his work as an Army medic. He recalls numerous incidents and indicators that preceded the start of his life-work and that influenced his choices. Bob believes that a “guiding hand” has been at work in his life since his early teens – probably before. At age 14, Robert, an athletic boy, was practicing jumps. Somehow, he landed too hard from too high and damaged the arches of both feet. Bob’s dad had once seen an Osteopath and he decided to take his son to see if this physician could help. They reached the address that Dad remembered. The interior didn’t look the same, but the two spoke with the receptionist and sat down to wait. Within a few minutes a young man greeted the visitors with a firm handshake and a broad smile – definitely not the same doctor! Thus commenced an eight month physical and dietary regimen that not only healed the damage resulting from Bob’s fall, but also resolved other medical issues that had presented. Most significantly, under the guidance of this physician, Robert committed to a health-centered lifestyle that’s served him well and that has empowered Dr. Robert Karl Morovitz, D.C. to help many others. Was the unintended visit to a Chiropractor’s office an accident? Bob doesn’t think so! Robert excelled at Beaumont High School and, like many students, he had a part-time job. He enjoyed his work and the people at Reynolds Aluminum. Bob did well in a variety of assignments that included warehousing, inventory and shipping. Robert thought the most interesting department was printing and that someday he might like to train in this area. Graduation ceremonies called for decisions to be made. Having come to know Robert as a valuable employee, Reynolds Aluminum offered him a full-time position. Bob was grateful to his bosses for the vote of confidence; however, military service seemed to be the best choice at that time. In parting, management assured Bob that there would be a job waiting for him when he returned. Upon discharge from the Army in 1956, Robert faced another big decision. As promised, Reynolds Aluminum offered him not only a job, but also full expense-paid training leading to the status of journeyman printer and Robert’s choice of company locations – an opportunity not even dreamed of a couple of years earlier! There was, however, another career possibility that Robert wished to explore. Beginning with his early experiences with Dr. Derda, followed by his recent work as a medical corpsman, Bob’s interest in the healing arts was taking root. Chiropractic care appealed to him because of the good results that could be achieved without the use of medicines. Difficult as it was, Robert declined the Reynolds offer and prepared to start college. After earning his Bachelor of Science degree at Vermillion College, Bob enrolled at the Missouri Chiropractic College in St. Louis, Missouri. Earlier, Robert had met the lovely Mary Schwab and the two began dating. On October 25, 1958, the couple married, commencing a fifty-year partnership that produced two gifted children, David and Michelle. Now, as Robert begins training for his life-work, prospects for the future are bright indeed! Upon completion of chiropractic studies, Dr. Morovitz partnered with Dr. Derda, his former mentor. In 1963, Missouri Chiropractic College merged with the well-known Logan College of Chiropractic, effectively making Robert an alumnus of Logan. In the years following, Dr. Bob developed close ties with faculty, students and directors at Logan College, now known as Logan University. There were seminars, workshops and special events, as well as academic and professional relationships that enriched and supported Dr. Morovitz in his efforts to be a more effective caregiver. 1963 — A NEW SHINGLE IS HUNG! The small community of New Athens, Illinois had never had a chiropractor and neither, Dr. Bob guesses, had any of the small towns surrounding New Athens. Bob suspects that his decision to start an office there had something to do with a nudge from his now familiar “Guiding Hand.” Almost from day-one, folks in pain filled Doctor Bob’s waiting room. The doc never advertised. Patients just talked with friends and neighbors about how good they felt after treatment. Many patients became good friends. Retirement years were wonderful — until the morning of February 19, 2013. Now 78, Doctor Morovitz drove to town to pick up a prescription. Upon returning to the car, he had trouble opening the door. When finally seated, Bob had difficulty putting his foot on the brake pedal, as was his custom before starting the engine. Next, he found that he could not insert the ignition key. After several tries, our hero managed to drive himself to the hospital. “I THINK THAT I’M HAVING A STROKE!” he screamed. He was indeed. Now a resident of the Missouri Veterans Home – St. Louis, Robert may be seen wheeling down the hall to the dining room for a game of poker or bingo, or maybe to the recreation room to watch his favorite sports on wide-screen television. “Bob,” as friends know him, usually makes an appearance at Happy Hour and other groups that involve stimulating and up-beat conversation. Robert Morovitz wants to thank EVERYONE who has helped him since his stroke: staff and residents, also friends and family who live on the other side of these doors. Bob tells this biographer that most of all, he loves and respects the hardy men and women who daily make their way down these halls with courage, grace and good humor. We love you too, Bob, and we’re very glad that you choose to make your home with us. SEE YOU AT HAPPY HOUR! We are honored to say thank you to another Veterans Home resident who proudly served our country in the United States Armed forces. In the fall of 1949 Curtis E. Washington, a native St. Louisan, enlisted in the U.S. Army Reserves and took his basic training at Fort Leonard Wood, Missouri. In 1953, Private Washington went active duty and was immediately TRANSFERRED to South Korea where he joined an Infantry Motor Pool unit as a driver and machine operator. 1955 saw Mr. Washington return as a veteran to family and friends in St. Louis. Thanks to a suggestion from his brother in law, Curtis was interviewed and hired at McDonnell Douglas where he prospered during a 30 year career with the aircraft company. As Curtis and I talked, a profile of this interesting man began to take shape. From early childhood he was guided by his parents’ religious beliefs. As a young man, a close connection with his church, and a committed practice of faith in daily living, built a spiritual foundation that continues to sustain this veteran. Mr. Washington affirms that his relationship with God is the cornerstone of his life. Curtis believes that with “God in Charge,” good things happen. The Washington family is a shining example. Curtis junior was first to arrive. Then came Tracy, and Sonya. Lastly, Kevin joined the family. Kevin has never been content to be last in life, however. As a young boy, and through junior high and high school, Kevin loved football. Football was the “family sport”, with everyone sharing as Kevin earned one recognition after another. Today, Kevin works for the VA in a responsible position at Central Supply. Sonya helps keep everything running smoothly at the road maintenance department of the city of St. Louis, and daughter, Tracy, loves her work as a career Registered Nurse. First born, Curtis junior enjoys a rewarding career in auto sales. Curtis’ energetic wife, Sandy, has been our veteran’s travel companion, singing partner, ADVISER and best friend for twenty years. Before meeting Curtis, Sandy like to travel. Now that her husband has retired, it is time to show him a few of her favorite places - and that she does! First Paris. Then the Bahamas. Now, Jamaica. Also Hawaii. Let's not forget Las Vegas, Southern California and Florida. During Sandy's career at Southwestern Bell she made many friends. These included others, like herself, who loved to sing gospel music. Now retired, these friends often sang together for enjoyment. The group performed at local churches and also out of town. Early on, “Bell in Action” invited Curtis to sing and travel with them. As the Washington family grew, everyone participated in activities such as basketball swimming baseball and football. There was one that Curtis loved most and still does – fishing! He says he doesn't care what kind of fish are biting on any given day. He likes to fish for the pure joy of it! It was on such a day in 2012 that Curtis decided to spend an afternoon on the river. The shore in this spot was rocky and a little difficult to navigate. Our angler wasn’t as close to the water's edge as he wanted, so with the next cast, he arched his swing as far forward as he could. A flash moment in time and Curtis lay prone on the rocks, sharp pain shouting that something is very wrong. When the best medical treatments could not repair damage caused by the fall and stroke, Curtis chose healing of another kind - the restoration of mind and spirit. Our veteran, who has always been a man of faith and action, entered the Saint Elizabeth day care program where he found the resources he needed to move on. Move on, he has! In April 2014 Curtis became a resident at the Missouri Veterans Home. A friendly man with a ready smile, Curtis it often seen at bingo or talking with other residents in the recreation room. We’re coming to know him as a man who is generous with his time and happy to assist wherever he can. It has been my pleasure to work with Mr. Washington in sharing his story with all of you. Thank you, Curtis. The “Big Sky Country.” Rolling hills and endless green. Under a canopy of blue, you guide your ride to the forest. Now, to the mountain. On the way, a chattering trout stream calls for your skills. Montana. What a place to grow up! What a country to know as yours! Such was the experience for Ernest Mitch. Born in Missoula, Montana on July 7, 1922, Ernie grew up happy as the “middle” child. His younger sisters, Dolores and Betty pestered, but adored him. Arnold and Joe were always there to show their kid brother the ropes. The Mitch’s loved being a family in this beautiful part of the world. Hunting, fishing, hiking and camping were almost as close as the back yard. Upon graduating high school, Ernest enrolled at the University of Montana – Missoula. On a crisp Sunday afternoon in December of his second year, Mr. Mitch and his Sigma Phi Epsilon fraternity brothers were hosting a Tea and Dance for sorority sisters. At around 5:00 pm, the music stopped abruptly. Then the announcement: “The U.S. Naval Station in Hawaii has just been attacked by the Japanese!” A stunned silence ensued. A few weeks later representatives of the U.S. Navy came to the college to describe a government sponsored flight orientation program. Because of the urgent and immediate need to defend our Country, students who passed this screening would be granted priority consideration to enter pilot training. Ernest had never been in an airplane, but since the flight time would be free, why not? His first lessons were in a J-3 Piper Cub. After learning basic maneuvers, he advanced to a larger aircraft, the Waco bi-plane. Having discovered an aptitude for flying, it was time for Ernest to make a decision. Should he go for military training or remain in school? Mr. Mitch reflects, “There was no doubt about what I should do. I had grown up with so many benefits in this Country that I love, I figured it was my turn, now.” At the end of the current semester, Ernest Mitch became a cadet in pilot training at the Naval Air Station in Long Beach, California. Here, our veteran immersed himself in ground school, physical conditioning, military protocol and primary flight training. In three months, Mr. Mitch flew solo for the first time and was transferred to Corpus Christi for advanced flight and tactical training. Now a second lieutenant in the United States Marine Corps, Ernest was scheduled for his first overseas assignment. Lt. Mitch joined a Corsair squadron on New Hebrides as a replacement pilot. Almost immediately, he saw action escorting and protecting our bombers as they destroyed the major base for the Japanese fleet at Rabaul. These Corsairs were also deployed as bombers, flying in formations of four to eight. Later, First Lieutenant Mitch flew the Corsair on missions to secure the island of Guam. The Marine Corps said it was time for a little rest and relaxation (R&R). Ernest and other single officers were assigned temporary billets at the Laguna Beach Hotel. While lounging in the sun one afternoon, Ernie met Audrey, a lovely blond who lived and worked close by. In the days following, Audrey showed Ernest the local sights. They sampled the fare at seaside eateries, enjoyed strolls on the beach and promised each other to stay in touch. The Corsair aircraft that Mr. Mitch flew in the war with Japan, and would again fly in Korea, was one of America’s finest and most versatile warplanes. However, jet aircraft were now becoming available to our fighting forces. Lt. Mitch was transferred to Pensacola Naval Air Station to transition to turbine powered aircraft and to train other pilots who had previously flown only piston powered equipment. Soon, Ernest’s duties were expanded with a promotion to Captain and assignment to the training command at the Marine Air Station, Quantico. Here he was joined by his bride-to-be. He and Audrey were married in 1944 and set up house-keeping in Fredericksburg, Virginia. Early in 1945, soon after the birth of the Mitch’s first child, David, Ernest was transferred to Midway Islands. Shortly after his arrival, military strategy shifted and the Captain was told to expect a change of assignment to Hawaii. The problem from Ernest’s standpoint was that he was expecting the arrival of his wife and son. Earlier, the Marine Corps had said that the boy must be at least five months old before he and his mother could make the long voyage to Midway. To Ernie’s relief, the Corps agreed to delay his transfer to Hawaii until the family was reunited. Hawaii was still recovering and rebuilding from the horrific damage caused by the Japanese attack. Part of Captain Mitch’s job as an adjutant to the commander was helping to coordinate with civil authorities the many tasks yet to be done. Mr. Mitch also stayed current in the Corsair. The happiest event during the family’s three year stay in Hawaii was the birth of their first daughter, Diane. It was clear by now that issues regarding Korea were coming to a head and that the United States would likely become involved. With the defeat of Japan, a suitable air station and jumping-off point to Korea was now available for use by American aviators. To that end, Captain Mitch and his squadron of Corsairs were standing-by ready to fly. At 0600 hours on August 6, 1950, Marine Fighter Squadron 323 is ordered to Badoeng Strait to lead an attack against North Korean targets. This successful mission was the first to be flown by Marine Aviation in Korea. During his tour of duty in Korea, Captain Mitch flew 94 bombing missions in the Corsair. This powerful and versatile fighter was armed with bombs, rockets and machine guns. Tactical units flew in squadrons of four to sixteen aircraft, forming a deadly phalanx of firepower and destruction. As the fastest piston-engine fighter at the time, this gull-wing bird excelled in one-to-one combat, even when carrying heavy munitions loads. Returning stateside, Captain Mitch trained pilots at Cherry Point Naval Station and Olathe Naval Air Station. While at Olathe, the Mitch family welcomed second daughter, Cynthia. Shortly thereafter, Captain Mitch was promoted and transferred back to the training command at Quantico. Time for a rest? Hardly! Long Beach, California became home. Now, the family could enjoy quality time without concerns over Dad’s safety or unexpected transfer orders.